Today, I was greeted by this adorable little girl in the mail, Edna Annie. Isn't she cute! I found this website on Friday that you just have to check out, http://www.raggedyoldannies.com/. 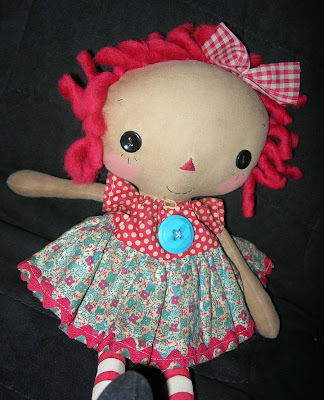 I had seen someone on HGTV years ago making these cute dolls... who knows maybe it was her. I can't remember it was too long ago. Anyway, as soon as I saw her blog and website I just had to have one. I have been wanting one of these dolls ever since I saw them on TV. I had originally planned to purchase one for my daughter for Christmas, so I found Edna Annie and had to adopt her. So, I quickly made the purchase so she would not go home to someone else, and immediately got an email from Nicole saying that she was on her way. What fast service! I was impressed to say the least. WELL.... today, she arrived. She is so well made and so adorable... that well... I just had to keep her for myself... I'll get Paige some other things for Christmas... this one was mine. Just look at her... She looks so cute next to my Moda Home Apron Strings Lunch Tin. 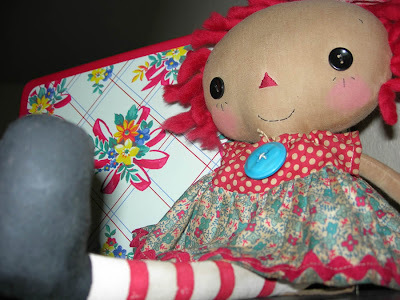 Doesn't she make the cutest little Annies? Very fun!